You hear about the book Initial Public Offerings: The mechanics and performance of IPOs and decide that you want to know more about the research of the author Prof. Arif Khurshed, Manchester Business School, University of Manchester. You could look at Prof. Khurshed’s Manchester Business School academic profile, or his University of Manchester research profile. 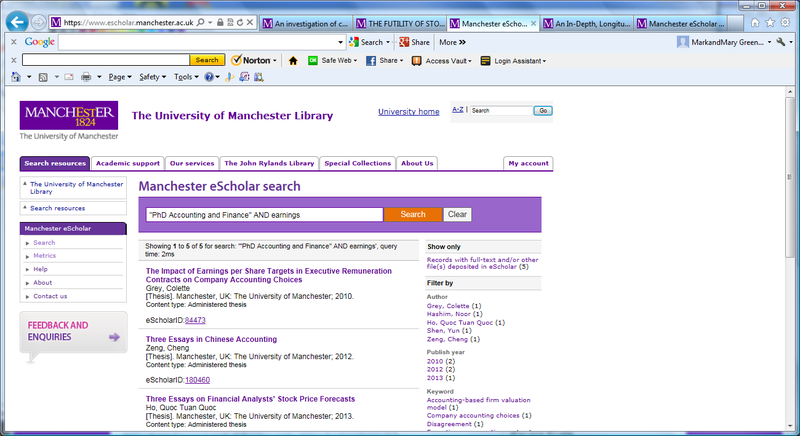 You could also do a search in the University of Manchester institutional repository eScholar. There are a number of advantages to using eScholar. recent theses that he has supervised. The main disadvantage to Manchester eScholar is that it is a relatively new service, officially launched in April 2009, so may have limited information on publications before this date. After reading the MBS news Gary Davies takes Tesco Professorship you could lookup Prof. Davies academic publications in Scopus. One popular feature of Scopus is that you can order results in terms of “Cited by” so you can start your browsing with those articles that are most cited (by other papers within Scopus). Remember that this will be biased in terms of older articles that have had longer to be cited. When you find someone of particular relevance to your research area then you might want to investigate keeping up to date services. Obviously if you are researching an academic researcher not at the University of Manchester then you will have to look for their institutional repository, which may vary in some features from Manchester eScholar. Open Access makes scholarly work available online, free of charge, to anyone who wants to read it. An appropriate time to highlight some open access resources. Open Access at Manchester provides lots of valuable information from “what is open access” to details of the library services for University of Manchester researchers who want to publish their research open access. Open access posts on Impact of Social Sciences – this LSE (London School of Economics and Political Science) has included several posts on open access topics during the past week. The effect of open access and downloads (‘hits’) on citation impact: a bibliography of studies – an extensive bibliography on the relationship between impact and access. To browse the Manchester Business School PhD theses in eScholar you can search “PhD Accounting and Finance” or “PhD Business Administration“. Tip. Remember to use AND between search terms in eScholar, e.g. “PhD Accounting and Finance” AND earnings. You don’t have to read a PhD thesis in full. Sometimes it can be useful to skim the related work, and references, or focus on the research methods used. For more details on other University of Manchester theses, (ie. 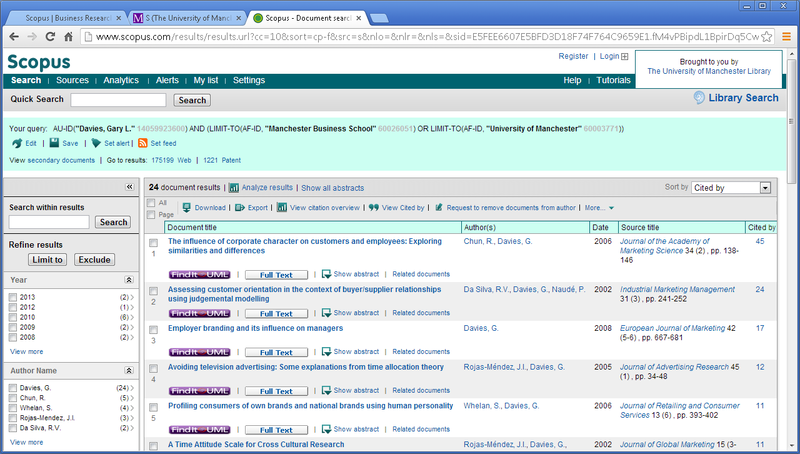 not available in eScholar) see earlier post Manchester Business School theses (posted July 2012). The Nielsen report did mention that an increasing number of people are using social media as their medium of choice for contacting companies. So far I have not been able to find any research on this topic. Please leave details if there is research you recommend on any of the three aspects above. Chairman’s optimism and future return uncorrelated? 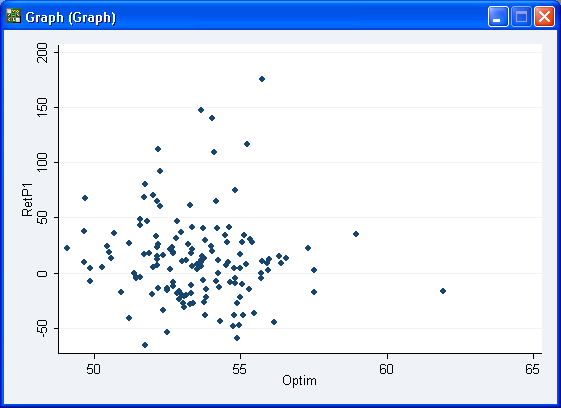 This scatterplot shows the relationship between the percentage total return in the following year (RetP1) and the optimism of the chairman’s statement in the annual report (Optim). In general it appears that increased optimism only corresponds with increased variability in returns. This has only been done for a small sample of 29 FTSE 100 companies over the years 2006-2011. The main purpose was to provide an example of analysis using textual, rather than numeric, information in company annual reports. Convert the annual reports from PDF to Text. 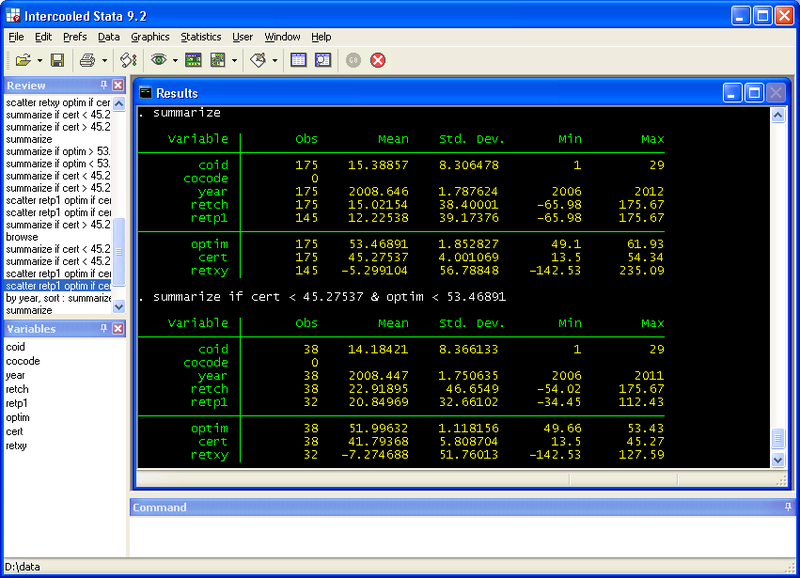 Analyse the statements using the text analysis software Diction. Link the results from Diction with the total return (obtained from Datastream) for the same and following year [Total shareholder return (July 2011)]. From a library perspective the main interest is the research process rather than the results, and specifically the data collection needed to assemble a dataset for analysis (steps 1-4 above). Researchers have to work hard to transform the raw data available to them into a dataset ready for analysis. Another scatterplot showing the relationship between the percentage total return in the current year and the optimism of the chairman’s statement shows a similar lack of correlation. Looking at both the certainty and the optimism that is measured in the chairmen’s statements, this small sample shows that a certainty below average and an optimism below average give a total return in the following year, and in the current year, that higher. This is only a small sample, and we have no theory why selecting companies because their chairman’s statement is uncertain and pessimistic should be better than random selection. There is no doubt that technology developments, and in particular the use of social media, is of interest to many researchers. For business and management researchers this can involve both the impact of social media/technology on being a researcher, and the impact of social media company strategy, marketing, knowledge management etc. Communications / Internet / Social Media posts from London Business School BizResearch blog – latest A Portrait of Today’s Tablet Users – Wave II from the Online Publishers Association (OPA). There are various social media links in the previous post Research awareness and dissemination.